A beautiful smile is an accessory that never goes out of style. It can make others feel warm and welcome, and it can help you thrive in any social situation. It even has the potential to make you look younger and more successful. If your teeth have obvious flaws, however, you might be missing out on your smile’s potential. That’s where porcelain veneers in Metairie come in. This treatment offers a fast and effective way to transform the way your teeth look. Since they’re made out of high-quality materials, you can expect veneers to last for at least 10 – 15 years before you need to replace them. Furthermore, because porcelain is resistant to stains, your smile can maintain its luster for a long time. The veneers might even improve your oral health; in order to take care of them, you’ll need to take excellent care of your entire mouth. The number of veneers you receive is up to you. Some patients want just one veneer to cover an especially unsightly tooth, while others opt for a full set of 4 – 8 veneers to dramatically alter their smile’s appearance. 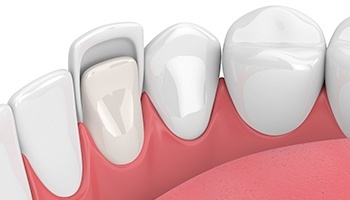 The porcelain veneer treatment process usually takes place across two appointments. During the first appointment, Dr. Nelson prepares the teeth that will support the veneers. He must remove a thin sliver of enamel so your new smile doesn’t look bulky or unnatural. Then, he’ll take detailed impressions and images of the teeth, which will serve as the basis for creating your custom veneers. You’ll wear a temporary veneer while a dental lab expertly crafts your new look. Once the veneers are ready, you’ll return to our office so Dr. Nelson can make any necessary final adjustments to them before he attaches them to your teeth. If you’re thinking about getting porcelain veneers, come to our office for a consultation! During your appointment, Dr. Nelson will examine your mouth and talk to you about your smile goals. Once he gains a clear understanding of your oral health and what you want to accomplish, he can recommend an appropriate cosmetic treatment. Are you ready to say goodbye to your smile’s flaws and hello to a grin that just won’t quit? Dr. Nelson is a skilled cosmetic dentist who would be happy to help you reach your goals. Contact us today to schedule your consultation!